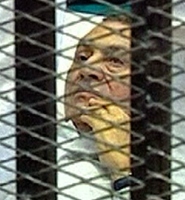 (New York Times): An ailing Hosni Mubarak, who served longer than any ruler of modern Egypt until he was overthrown in a revolution in February, was rolled into a courtroom in a hospital bed on Wednesday and charged with corruption and complicity in the killing of protesters. The trial was a seminal moment for Egypt and an Arab world roiled by revolt. Even the most ardent in calling for his prosecution doubted until hours before the trial began that Mr. Mubarak, 83, would appear, a reflection of the suspicion and unease that reigns here. As a helicopter ferried him to the courtroom, housed in a police academy that once bore his name, cheers went up from a crowd gathered outside. “The criminal is coming!” shouted Maged Wahba, a 40-year-old lawyer. The sheer symbolism of the day made it one of the most visceral episodes in modern Arab history. In a region whose destiny was so long determined by rulers who deemed their people unfit to rule, one of those rulers was being tried by his public. On this day, the aura of power — uncontested and distant — was made mundane, and Mr. Mubarak, the former president, dressed in white and bearing a look some read as disdain, was humbled.